KitJam | blog | World Record Holder Mimi Anderson chats to us about her Marathon des Sables and encouraging more women to partake in marvellous ultramarathon running. KitJam - As we bring Women’s Sports Week to a close, we couldn’t think of anyone more suitable to chat to than ultrarunning legend Mimi Anderson. KitJam — You’ve probably done every race going and we’re always inspired by the events you’ve taken part in, but take us back to your first ever multi-day race, the infamous Marathon des Sables (MDS)! Mimi — I took part in the Marathon des Sables in 2001. In those days you had to enter via the postal service so everything took rather a long time but there wasn’t a wait list which was marvellous. I ran as part of a team called “Tuff Muthers”. When we signed up for the race the longest distance I had run at that point was 21km but it seemed a natural progression and such an adventure. We put together a training plan which we had to work around our families. Back in the dark ages many people didn’t have computers as they were so expensive and there certainly wasn’t any form of training plans the you could search for. The only option was to devise our own plan which actually is very similar to what people would do today! Training had gone well and the three of us flew to Morocco for the start of the race — I was extremely excited, just couldn’t wait to get going. Unfortunately I picked up some sort of a bug which resulted in me collapsing and being taken to the medical tent at the end of day three where they tried to get me to drink a rehydrate mixture but all I wanted to do was go to sleep — a classic sign of dehydration. The medics had no choice but to put me on a drip and I eventually got back to my tent in the early hours of the morning. The following day was our long day and our plan was to do it all in one go. Coming up to the half way point I was really struggling and couldn’t keep up with my team mates. I remember tears streaming down my face as I simply couldn’t see how I was going to get to the end of the day, let alone complete the race. Max (one of my team mates) came up to me and having checked I was OK she said “think of all those people at home who think you’re going to fail” and walked off. Sounds like a harsh statement but boy did it work, there was no way I was going home without a medal. Once we reached the half way checkpoint the girls got me into my sleeping bag while they cooked food — as soon as I put anything in my mouth it came straight back up again which unfortunately meant the medics wouldn’t allow us to continue until daylight. I was gutted but we did finish and went on the next day to complete the marathon day then the final 21km run to the finish line. 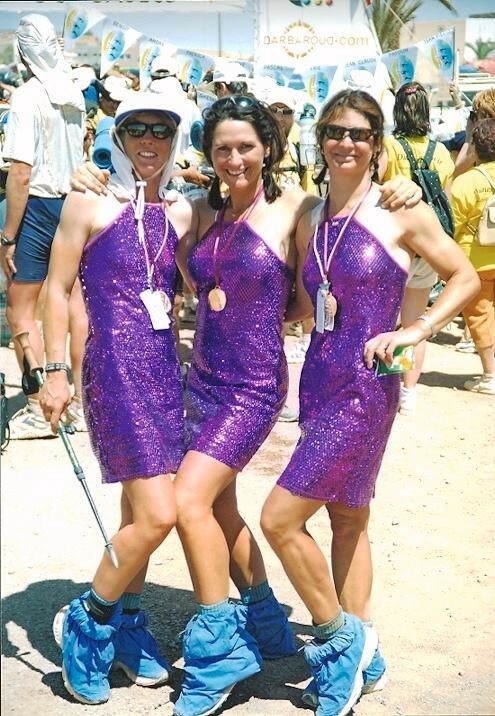 About two km before the end we all changed into purple sparkly dresses that we had carried with us and crossed the finish line causing a huge amount of laughter from the other competitors. Once back at the hotel I collapsed again and the medics had to give me more IV drip and strong antibiotics as I had blood in my urine! the things we do to ourselves!! Although the race didn’t go to plan I finished and achieved something I never in my wildest dreams would be possible and to make it even more special we won the prize for the team with the best sense of humour! KitJam — Wowzers. Quite incredible to never have run further than 21km and then take on the MDS! Blood in your urine and some harsh words of encouragement to keep you going — respect Mimi! Kit for a race like the Marathon des Sables has probably evolved somewhat as brands battle to bring out the lightest version of absolutely everything. Talk us through your approach to kit for MDS? I was quite pleased with my pack as it weighed about 8kg so not sure I could have got it any lighter. My luxury item was a blow-up pillow, simply fantastic and helped me sleep and likewise my sleeping mat. There were a few people who decided not to carry a mat which meant they were very cold at night, leaving them tired for the next day’s run. The kit has improved so much now as has the nutrition side of racing. I wouldn’t bother with a stove as the water is warm anyway at the end of the day so although my food wouldn’t be hot it would have been edible! I took hot chocolate to drink each evening, this I would definitely do without as I ended up giving it away. KitJam — The number of women taking part in MDS increases steadily year on year but female participants still represent less than 10% of the overall field. Were there many women taking part when you raced it? As an Ambassador for Free to Run, what do you think could be done to increase the number of women taking part in these races? For the 2001 edition of Marathon des Sables I believe there were only 12 women from the UK who took part which is very low compared to today’s numbers. Although still a very male dominated world, there are more and more women participating in sport which is great to see. I think a mentorship program would be a good starting point, this can support someone or a group of women when they first set out on their journey to multi-day racing giving them advice, guidance and encouragement. By setting up such a mentorship program it can reach out to women all over the world which is fantastic. There are many women with young children who struggle to find the time to participate in sport and even if they do the cost of taking part in a multi-day racing is extremely expensive and time away from the family which isn’t always easy. Events could be organised that are either a week or over the weekend that could include the family. This may help elevate the guilt factor of being away from their children. By encouraging more women into the sport they not only get fitter and feel better about themselves but they in turn show their children that it’s quite normal to be active and that it’s enjoyable. Women only training camps where perhaps they may open up more and feel more relaxed and comfortable? The more we show women what is possible, the more it will encourage them to want to give it a go — nothing is impossible with the right information and guidance. KitJam — We’d love to be mentored by you any day Mimi, as I’m sure countless others would be. You’ve definitely planted a seed though so we’ll have a think how KitJam could help kick off such a mentorship programme. Run The Sahara do run women-only training camps at their training camps in Morocco, so that’s a start! When doing multi-day events like the MDS, what is your favourite running snack and meal brand? Same goes for clothing, what is your all time favourite piece of kit to run in? I love the X-Bionic Twyce running shorts and short sleeved running shirt (the shirt of course is pink!) Both are incredibly comfortable and designed to maximise sweat evaporation, great bits of kit. One of my favourite snacks are twigglets! Quite simply I love marmite. During my racing career I have never used a meal brand as have always made my own meals up. In 2001 most people (that I met) had put together their own meals as it worked out lighter to carry. Perhaps when I next do a multi-day event I will try one of the meal brands! KitJam — As you know Mimi, we can’t claim to share your love for pink kit here at KitJam. Our users however can’t get enough of it, so it’s clearly us and not you! We know you’re shortly running across the USA, now you already have several long distance world records under your belt (including LEJOG) but this is simply the ultimate in long distance running. Both KitJam co-founders will be there to crew you and we really cannot wait. Tell us more about your kit choices for the US crossing, what will you be running in and how many pairs of trainers do you think you’ll get through? I never know whether to be excited or absolutely terrified by the thought of running across America but it’s something I have wanted to do since 2011 and will give it everything I have got! Imagine the thought of starting on the West coast and several weeks later finishing on the East coast! mind blowing. I will be running in X-Bionic kit as I have been wearing their clothing since 2012 and just love it. My trainers are Hoka OneOnes, again I have using these since 2011 when I did my first Spartathlon and they suit my feet. Their trainers have got better and better over the years. I will probably take out about 10–12 pairs of trainers, a couple of them in a slightly larger size in case my feet swell. I like to rotate my shoes each day but will probably go through about 8 pairs! KitJam — And there you have it folks! Ultrarunning legend Mimi Anderson is simply like no other, the world’s most inspiring long distance runner. She doesn’t just run crazy distances though, you really have no appreciation for how many other women and girls she inspires along the way. There simply isn’t a better ambassador for women in sport and we are honoured to round up this week by sharing this interview with you. Get out there ladies! Mimi has a book coming out in August and you can (and really should!) pre-order your copy here now : Beyond Impossible!